With a run that included top end tricks such as Tootsie Roll, Skeezer, Heelside 720, Batwing, and Dum Dum the Junior Men's division saw Jorge Gill take his place as the 2012 Junior Men's National Champion. Holding it down for the junior ladies, Megan Barker added to her recent Open Ladies Nationals title by taking the 2012 Junior Ladies National Champion title. Her run included a tantrum, 360, toeside back roll, roll to revert proving that her 2012 season has seen her arive at the top of the UK talent tree. Mastercraft provided a brand new 2012 X2 for the event and with the boat loaded up with ballast and crew the wake was immense, perfect for the next generation of UK riders to show the judges their skills. 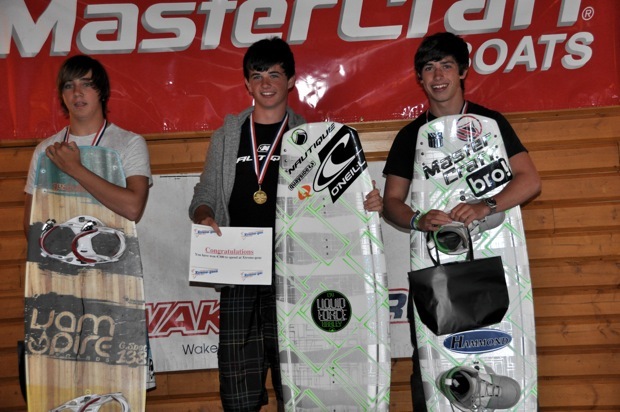 Official Results are available on the Wakeboard UK Official Results page including the winners in the Groms, Boys, Girls, Junior Mens, Junior Ladies and Wakeskate divisions.